This high-strength, two-part epoxy system comes in a convenient cartridge. Dispense a bead of thickened, structural epoxy perfect for bonding, sealing, and filling jobs. Included mixing tips ensure perfect resin to hardener ratio. 185 ML cartridge fits all standard caulk guns. Size: Available in an individual 185 ml cartridge (with 2 static mixing tips), or in a package of six cartridges (with 12 static mixing tips). No need to haul out the separate cans of resin and hardener, mixing cups, stir sticks and fillers. 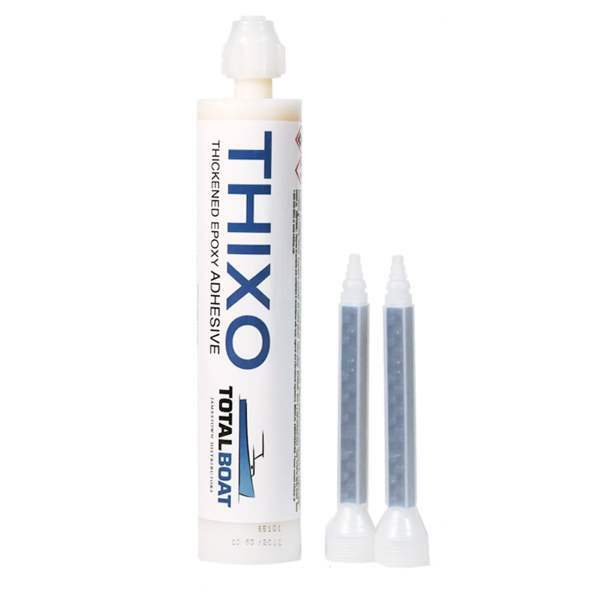 A Thixo cartridge, mixing tip, and a caulk gun are all you need to lay down a neat, uniform, pre-mixed bead of strong, waterproof, thickened epoxy adhesive in less time and with greater accuracy. The resin and hardener sit in separate chambers inside the cartridge. 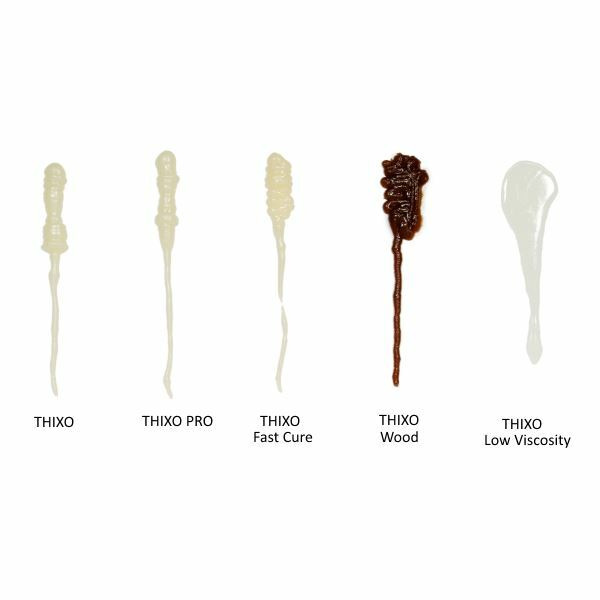 Squeeze the trigger and the resin and hardener slide into the static mixing tip where they’re blended together in a perfect 2:1 mix so Thixo comes out of the tube ready to go. Squeeze out just what you need, exactly where you need it. Use just what you need and save the rest—nothing gets wasted. And there’s really no cleanup. Just leave the mixing tip attached and let it cure. When you’re ready to use it again, just change out the old mixing tip for a new one. For longer term storage, remove the mixing tip and toss it, then replace the Thixo cap. It’s also much easier to store onboard—or anywhere else, for that matter. If you have a really big installation, try Thixo PRO. It’s our original Thixo formula packaged to provide 2½ times more epoxy adhesive. You’ll save money, but you’ll also save time not having to change out cartridges as often. Thixo and PRO can be used for many of the jobs you would normally use a 5:1 epoxy resin for, and they are compatible with our TotalBoat 5:1 Epoxy Resin. Thixo has excellent adhesion and its unique viscosity makes it versatile to use for projects ranging from overhead bonding and gap-filling jobs to filleting and small fiberglass boat repairs and tabbing. It’s especially easy to squirt into hard-to-reach places, too. Once Thixo cures, you can sand, paint, saw, machine, drill, tap, or file it. Epoxy forces you to work against the clock. At 77°F, Thixo gives you a generous 50 minutes of working time in which it remains workable inside the static mixing tip. The short 30-35 minute gel time means that once you apply it, it sets up faster so you can move on to something else. Because of the pre-blended 2:1 mix, the results are always the same—strong and resilient. Whatever you’re sealing stays sealed, whatever you’re filling stays filled, and whatever you’re gluing stays stuck. Our Thixo cartridge costs less than other 2:1 epoxy adhesives, and comes with two static mixing tips instead of just one. These unique tips do the mixing for you, and lay down a uniform 1/8" bead. If you want a larger bead, the tip has trimmable grooves to increase bead diameter. Be sure to keep a few tips on hand so you’ll have one when you need it. They’re inexpensive, and we have them in packs of 2, 12, and 60. The good news about the mixing tips is that you don’t need them for smaller jobs. You can just squeeze out what you need into a cup and mix it with a stir stick. Remember, the more thoroughly you mix epoxy, the better it will cure. Not all epoxies work the same. We’ve expanded the Thixo range to suit different applications. Each one is available as one cartridge with 2 static mixing tips, or in a package of 6 cartridges with 12 static mixing tips. Whether you’re a professional or DIYer, our innovative 2:1 epoxy system will provide great results, at a great price. Wood, fiberglass, brick, concrete, cement, glass, acrylic Adhesive: Bond brick, concrete, cement, and composites. Great for filleting. Wood, metal, fiberglass, and more For bonding and sealing applications. Not for use as a gap filler. Wood, fiberglass, metals, glass, ceramics, some plastics, and wet or difficult-to-bond hardwoods For building and repairing wooden boats and bonding parts that are prone to flexing. Thixo PRO Original formula Thixo in a larger cartridge containing about 2½ times more epoxy Wood, metal, aluminum, fiberglass, block, brick, concrete, glass, slate, tile, stone, and more Use for the same type of applications as Thixo. Thixo PRO gives you more adhesive for bigger jobs and more complicated installations.